My goodness, I should have done a review for this product sooner! Thank you for inviting me to review. 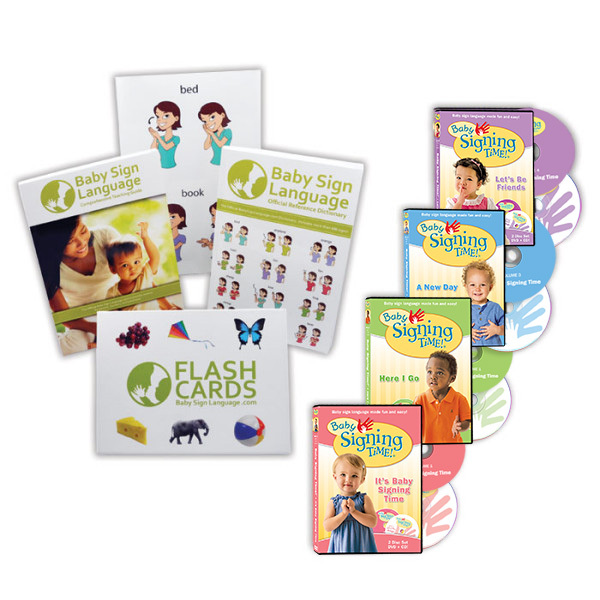 I purchased the Baby Sign Language Premium Kit when my daughter was approximately 6-7 months old. I was an enthusiastic teacher and she was an enthusiastic learner and I feel that her feeling that she had a way to communicate perpetuated her love for learning the signs that I was teaching her. She was an early talker and now at 33 months old she can rival the conversation of many 5 year olds and surpasses that of most 2 year olds she plays with. I will tell anyone when they ask what my secret was that I learned and taught her signs at an early age and I speak to her as though she can understand perfectly what I am saying. I explain everything – long before she could speak. After we learned and started using a few signs with the cards, I started taking them with us on outings. I didn’t want to let an opportunity pass us by where she could associate the word and sign I was trying to teach her with the thing that she was seeing while we were at the grocery store, park, etc. Eventually I only reinforced those signs that were relevant to us because she did start talking pretty early, but I continued to use the cards (in a different way) to help her develop language (by showing her the cards, pointing things out and talking about them…similar to using them as flashcards, but outside of signing). She loves to look through them even today. I’d highly recommend this set to any parent who is interested in giving their kids a head start on language development. The illustrations are vivid, the cards and other materials are high quality and can stand up to the hands of a growing baby! The dictionary was easy to throw in my bag when we were out (and necessary) for me to be consistent. 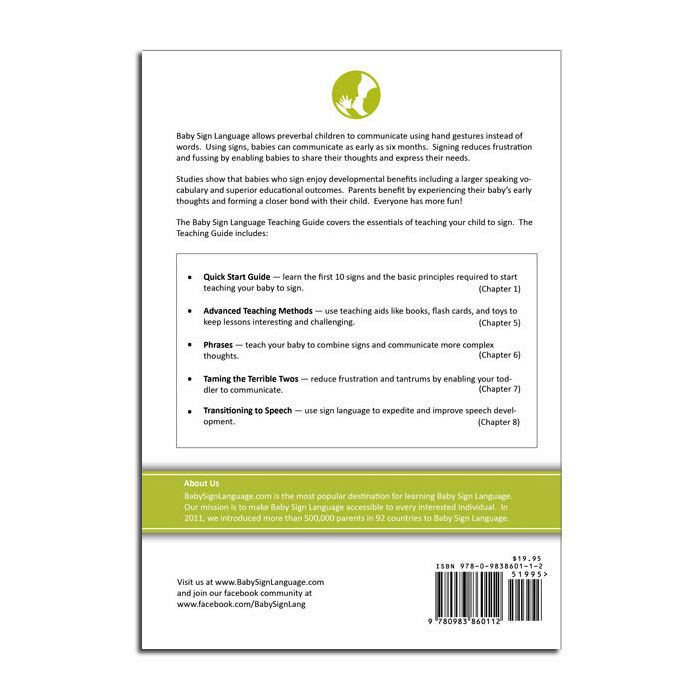 Excellent program to avoid frustrations while trying to communicate with your baby…. our daughter (now 3) stills use some signs she learned even when she can perfectly communicate by talking… not only that but it help her to learn words faster as well… i totally recommend it! My son LOVES the Signing Time Resources! He begs (with his signs of course) to watch babies. He has learned close to 50 signs that he uses regularly. My son has Down Syndrome and signing has opened up a world of communication to him that he would not otherwise have without his signs. The dictionary and flash cards are an invaluable resource! Great introductory foundation for baby. Especially useful for families with hearing impaired members. Gives baby the early skills of communicating with those hearing impaired family members. We ordered one of the larger kits and are satisfied with the results. We keep the flash cards and audio cd in the baby mobile and we have the poster in her room so we can reference it frequently. We put the dvds near our living room tv. So the complete kit was worth it for us because we have it everywhere. It serves as a reminder to us our child’s parents that we need to keep up with it. Every parent knows that kids learn quick, but this program is proof that babies are very intelligent at a very early stage. Just because they can’t speak (verbally), it doesn’t mean that we can’t communicate physically. Baby Sign Language simplified it for us. Yes, we get our occasional tantrums, but knowing my daughter has my temper, I know this program has reduced those tantrums to just a few of them or has shortened the durations of the ones she has. The other benefit we experienced is that my wife and I can sign to each other from a distance when we need something for the baby. We owe a lot of or daughters manners and well being to Baby Signing Time! She is able to study her sign language with her movies and flash cards while I study myself! I thought this was a great program and my children were interested up through their toddler years and even my 6 year old is still trying to teach herself signs and she is in kindergarten! The only thing I would improve is maybe having a DVD that the children could watch intermittently for times when you still want then to receive sign language instruction but you may not have a chance to do one on one time at that moment. Other than that it’s a great program! This program is AMAZING!! I started working on signs with my daughter when she was only 4 months old and by the time she was 6 months she was signing back some of the basics. Now she is 18 months and besides being able to sign almost her whole vocabulary she has advanced word production. Family and Strangers alike are astounded at the words she knows, can say, or mimic. I give immense credit to Baby Sign Language for aiding in my daughter’s development. She loves to sign to the DVDs and is OBSESSED with the flash cards, she loves being able to sign all of them (plus doing the animal sounds) and the praise she receives when using them. 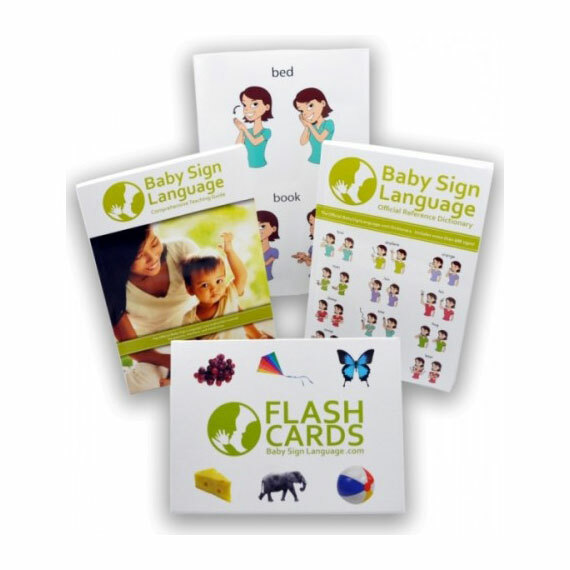 Overall this product is an investment that continues to pay dividends, I recommend Baby Sign Language to everyone I know who have young children. SO HAPPY I DECIDED TO MAKE THIS PURCHASE!!!! This curriculum is outstanding started using it at 3 months and by 6 months both babies were signing. We have loved welcoming Rachel, Leah, Alex and Hopkins into our home from when my daughter, Mika was 10months old. I attribute her excellent language skills to Baby Signing time and cannot stress enough how valuable and amazing it has been for us to enjoy watching these videos & seeing the incredible results in our baby, now 2.5year old toddler respond and sign words and now talk so beautifully. I just bought her the potty time series and I’ve put aside the beginner words for her new baby sister who is a month old. Thank you all for the excellent videos, catchy & lovely songs that we have on our TV and in the car. We absolutely love the cards with the picture on one side and the sign on the other. We started using them with our son at 6 months old and he was signing his needs well before he could speak them. Thank you! My daughter loves to sign! And this kit was incredible she picked up on sign language so fast for a 12 month old. As parents of twin boys, these cards and book were priceless in helping us to communicate with them at an early age. It has helped them express themselves much more easily and gave my wife and I a very fun activity to do with them. In fact, it actually taught us as well, which helped us communicate in crowded or noisy environments. I would highly recommend these to anyone with a new baby or babies. We loved our kit. My son really enjoyed the flashcards and took well to learning his signs. This is a great way to help them communicate when their verbal skills are still developing, but they are ready to communicate! We love this kit!! We started signing with my daughter since birth and she just turned 19 months old this month. The poster is a big help to remind my husband to sign with her. 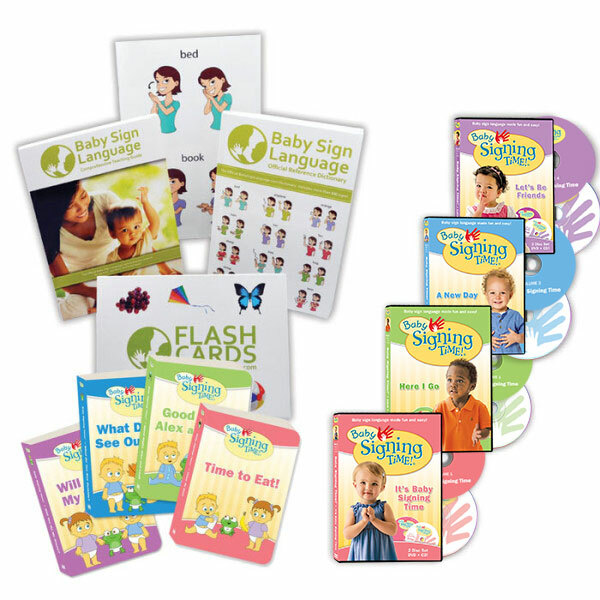 My daughter loves watching the Baby Signing Time DVDs and now she will look through the flash cards practicing her vocabularies and her signs. I run a dayhome and this is the BEST purchase I made. The kids love that even me ! It’s easy to understand illustrations of signs ! 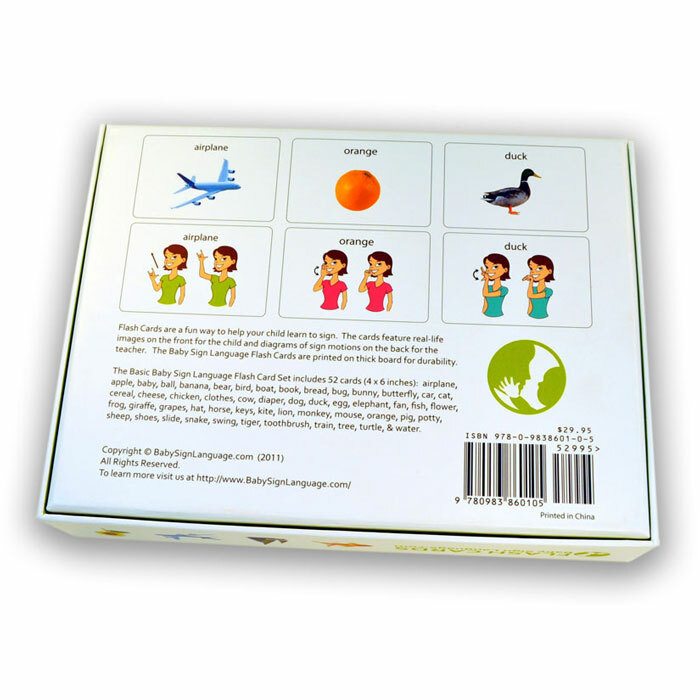 This product is a valuable tool in my kit for Speech Therapy for young and very young children. The pictures are simple and easy to interpret visually. The children respond to the colors and when paired with simple objects, they begin to make and establish a connection between the object/picture and increase comprehension of using communication to request and comment. Additionally, it helps parents and guardians to learn to use simple sign language to communicate with their child. Excellent product and I highly recommend it for any child. This program makes communication, which is very abstract, into a more concrete and easier to understand system. Very good product. The DVD’s are wonderful. My 3 yr old granddaughter likes to sit and watch them, she will sign along with them and has learned more signs by herself. I bought this program for her to communicate with us before she started talking. She learned the signs quickly and was using them appropriately. I would highly recommend this product. This system has been an awesome help teaching my granddaughter to sign. When she was 2, she was diagnosed to be within the autism spectrum and with Apraxia of Speech, basically she knows what she wants to say, but her brain and mouth do not communicate properly. This resulted in her just making random noises and getting very frustrated when we didn’t understand her. 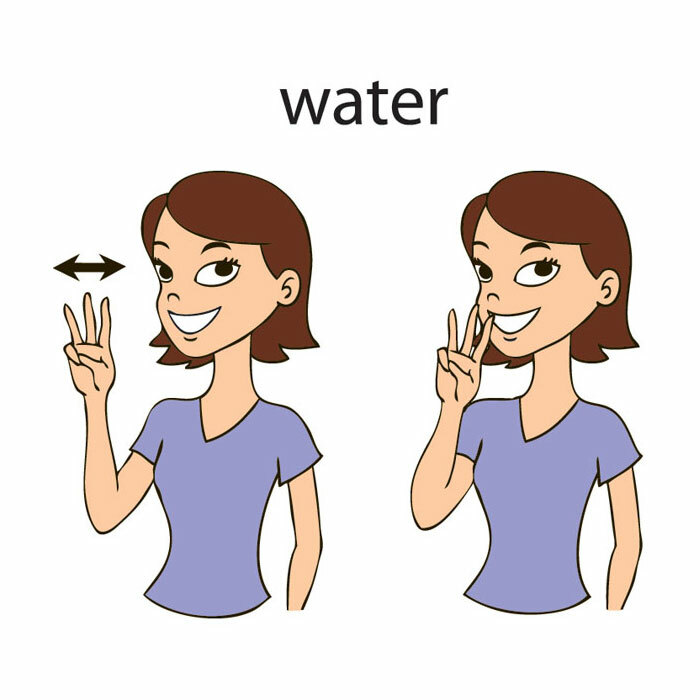 Adding signs to her vocabulary has allowed us to understand her better and work properly on her pronunciation. Since including signing into her communication, the frequency of meltdowns has dramatically decreased, as there is much less frustration. The flashcards are clear and colorful and the videos are engaging enough to hold her attention. I am extremely happy with this program and have recommended it to several of my friends. One thing I would like to see is more zoo animals. We have an annual pass to the local zoo and she wants to know what the signs are for all the animals. There are a few I haven’t been able to find (if they even exist) and she’s not ready for fingerspelling yet. I would do it again over and over. This kit is fun and very helpful. I highly recommend to sign to your baby as well as using this product which help my baby boy who is today 3.5 years old so much. His level of understanding is impressive, his vocabulary huge. My Daniel can establish conversations today in a way I notice is not normal for a kid his age. I am very happy we used sign language at home, this lowered the level of frustration when he was a baby and is working the same with our 10 moth baby too. She is already signing back and asking for what she wants (Up, down, more,milk, all done, banana, and much more!) Also is wonderful to help them feel empowered from the beginning and express their feelings. Baby signing worked amazingly for my son. As soon as he realized that he could use his hands to communicate, my son became so eager to learn the sign for everything. I think this also attributed to his early speech development as well. He began speaking at 8 months, saying the words of all the signs we use. Signing helped us to really understand each other and minimize his frustration. I highly recommend Baby Sign Language to all parents. I knew very little about sign language and never planned to make it a part of my child’s life, but when she started using signs she learned from a babysitter I thought I’d check into it. We ordered this kit right at 1 year and had no idea how big of a hit it would be! Not only does she LOVE them, but really learns from them! A year later we now have all the Signing Time DVDs and a 2 year old child who is an extremely advanced communicator. She loves to watch the videos and Rachel is amazing at teaching not only signs, but concepts along with them – colors, numbers, letters, and so much more. I always get comments on how smart my child is and I truly have to give Signing Time so much credit. I am a believer and so appreciative that this is available! 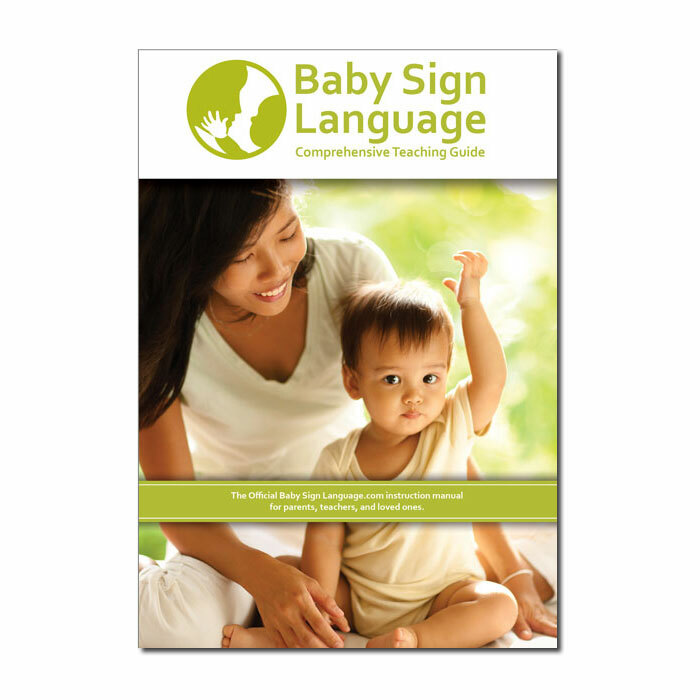 Everything you need to fully embrace baby sign language! My 17 month old loves signing and her spoken words are coming on great too – the signing is definitely helping with this. The flash cards are an absolute favourite. I would definitely recommend buying this kit. Sign language works for babies! Our daughter was able to communicate with us before she could talk. Then when she started making word sounds, we knew what she was saying because of the signing she would do. The kit we bought was fun and easy to follow; signing pictures are done well; information is relevant. I believe you get out what you put in. Initially I was the only one using the sign language cards with my granddaughter and you could tell. The big difference came when her mother started using them. She is almost 1-1/2 now and last week when we were at the beach she indicated she was hungry by using the eat sign. She has certain favorites and uses them. I find her most receptive when I first get her up in the morning. Keep in mind I was only able to work with her a couple times in a month. I am very satisfied. We started signing with my daughter at 4 months. By 6 months, she could sign milk when she wanted a bottle. By 18 months, she knew & used over 100 signs. We had so much less frustration & tears, because she was able to communicate her desires. Even if she just signs “cry” to me when she is upset, it seems to settle her down to be able to tell us she feels like crying. As she has started talking more, she uses her signs less, but still uses them to clarify if we don’t understand her words, & especially when she is tired. We LOVE baby sign language!! It is so easy to do, & it is life changing! For people with the misguided belief that signing delays talking, it may be helpful to know that my daughter’s pediatrician considers her language development advanced! When we bought our kit, the CDs and DVDs weren’t available, so I can’t comment on those. The only thing that keeps me from giving this kit 5 stars is the dictionary. It is hard to understand without written descriptions, does not include some common words, & has several mistakes. I was actually teaching my daughter the wrong sign for a word, based on the dictionary! I wholeheartedly recommend this program, but do not recommend the dictionary at all. I think even if you just teach your child a few basic signs, it will be rewarding. But once you get started, neither you nor your child will want to stop! I use this with my daycare kids. They picked up on the basic signs very quickly. Families are impressed that they learn ASL in my program. I wish I can upload the video of my baby going through the stack of flash card and signing each animal and food items. She’s 18 month old and my mind is blown. The manual and dictionary works together and the online video is what I found most helpful. It’s a good package to start I think for parents who want to teach enough for toddler to communicate. Tricks to remember each signs, how to take opportunity to teach sign. This is a great product at a reasonable price. I can’t say this is all that I used to teach my baby that’s why I put 4 stars. I used this to educate myself and my baby actually watches the Baby Signing time series DVD. But this is a great teaching plan for parents on teaching strategy. One more thing, I have to say the dictionary with illustration and arrows to indicate motion is pretty good for a 2D representation. Our son had speech issues and this kit was invaluable in helping us all through that time. We ended up using more than 100 signs and the resources helped us, our son and his day care all learn how to communicate with him. The dictionary is fabulous for more advanced and extensive vocabulary. The rest of the materials were also great. It really was a lifesaver and we have passed it on to our speech therapist to help other families. Best investment ever. I heard about baby signing thru my sister and nephew. She did not get this set but my nephew learned the basic signs and I thought it was delightful. I did my own research and led me to this. It was an unbeatable price compared to buying the books, flashcards, poster and DVDs separately. Research said not to get babies hooked on TV < 2 years old. Well, if its a learning educational show/DVD whats the big deal. Evidence based research changes all the time. We started watching the DVDs at 6 months old and showing flashcards. First sign he made was at 8 months "milk" we got so excited he cried because I practically yelled in his ear how proud I was. SORRY! I had the poster on our pantry door to practice while he is on his high chair. At age one he was able to communicate his needs by signing or both signing and mumbling the words. Now he is 20 months and he's never tired or sick of watching the DVDs. And sometimes he's the one who'll say stop or turn off when he's finished. He recognizes a lot of the flashcards and tries to say what they are. I used the dictionary as reference. We even made a few signs of our own. As for the the guide book, I just browsed thru it. I read the first few chapters on how to start signing and teaching my kid. Its all about repetition, practice and patience. Best of all interacting your child. Seeing that smile and laugh when he accomplish something. When he gets frustrated I tell him to sign it and I try to help him say the words and signing at the same time. Sometimes it helps and he calms down. But of course he's still a toddler. I can’t recommend these materials enough. We are a bilingual family and sign language has allowed us to fully understand what my daughter is communicating regardless of the verbal language she uses. The kit was easy to use and my daughter loves the cards. I would suggest the kit includes one resource for more advanced signers. We have learned all the signs in the cards and the dictionary and we are ready to move on to the next level. An advanced resource in the kit would have been optimal for us. This kit has really helped my family to incorporate sign language in our daily live. All I can say is…WOW! OK – a bit of history here…I babysit my next door neighbors’ little girl 2 days a week. I started when she was 3 months old. I wanted to make a difference in her life – not just “babysit” if you know what I mean. So…her 1st birthday was coming up (Dec 2014) and I wanted to do something that was meaningful. A friend of mine suggested Baby Sign Language, I did some research and found THIS! We started right way (2 days a week watching the videos) and the results were amazing! Took a few weeks for her to learn the first signs…but then… She exploded!!! By 16 months she was doing over 50 signs (not all perfect, however that’s ok)! To this day (August 2015) she knows almost 200 signs (not all perfect) and will be 20 months old on the 20th of August. Her parents are so thankful because she can communicate what she wants, and also if she is hurting, or doesn’t feel good! I can’t thank you all enough for giving me this “gift” of a second language for this precious little girl! I have since ordered the Signing Time Complete Collections (26 DVDs in all I think), and we are having a blast with that! Our daughter is slow to talk which is normal in our family (move focused on moving), but being able to communicate through sign has been a life saver. She is 18 months now and can tell us what she wants or doesn’t want. It also encourages her to talk while she signs, since she sees we are able to understand her. We started singing early but it wasn’t until about a year that she took interest. I think it was still soaking in before that. Fantastic product. Arrived within a week to New Zealand. We haven’t bothered purusing the signing as our 16 month old seemed to be saying the words faster than she was learning the signs but the DVDs are great entertainment and she loves watching all the kids doing the signing and she sings along to all the catchy songs. The only negative is that some of the words used are not words we would use in New Zealand (i.e. we say nappy not diaper). But overall fantastic value and money well spent. We had started with some basic signs from the website when my son was about six months old. After the first 10 or so basic signs, I was unable to remember the signs from the website long enough to communicate them to my son. So I bought this package when my son was about 18 months old. We started with only the DVDs. Not only did he learn, but my older children and I did as well! Even more miraculous is that we all ENJOYED IT! At 2 my son was still not a big talker but thanks to the DVDs, he signed enough to get his point across and eliminate many tantrums. Because he still wasn’t talking much, I reluctantly started doing the flash cards with him. We started by placing 4 on the floor at a time and having him point to the card I was saying and signing. Then we would do the sign together. Holy Smokes! That caused an eruption of knowledge for my 2 yr old! At 2 1/2 he now knows every single flash card and begs to do his cards multiple times per day. He follows people around with the box saying, “MY CARDS! MY CARDS!” until you agree to do them with him. He has forced my skeptical husband to learn the signs too, which is hilariously entertaining. Adding in the flash cards finally got my son excited about talking too, which has been a huge relief for us. The fact that he does the sign while he is trying to say a word verbally has really helped me to know what he is telling or asking me. Words cannot express how thankful I am for this product! 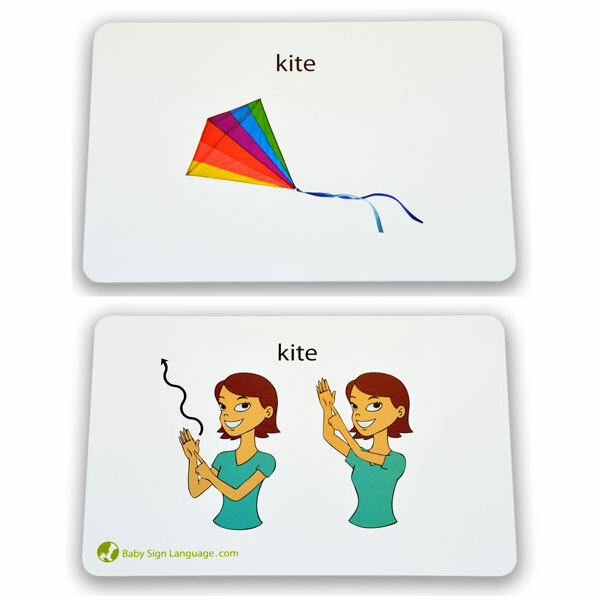 The flash cards are extremely durable and well made. They are a thick, cardboard material, not laminated paper. Despite the fact that we are not gentle with them and we use them several times per day, they are really holding up! The DVDs are even more fun now that we’ve watched them enough to remember the signs. The CDs are fun. He loves to dance to the music while he practices his signs (usually in the car). This product has introduced a love of signing into our home. My 10 yr old and I are now planning to take a sign language course because we have unexpectedly enjoyed signing so much! Bottom line, if you watch the DVDs you will pick up the signs and they will stick for you and your child. And then you will want to do more. The product is super fun, super easy to use and super fantastic! We cannot thank you enough for this fabulous product! We bought the Baby Sign Language set for our grandson who is speech delayed, about a year and a half ago. He started a program at a neighborhood elementary school and they had begun teaching sign language to him. 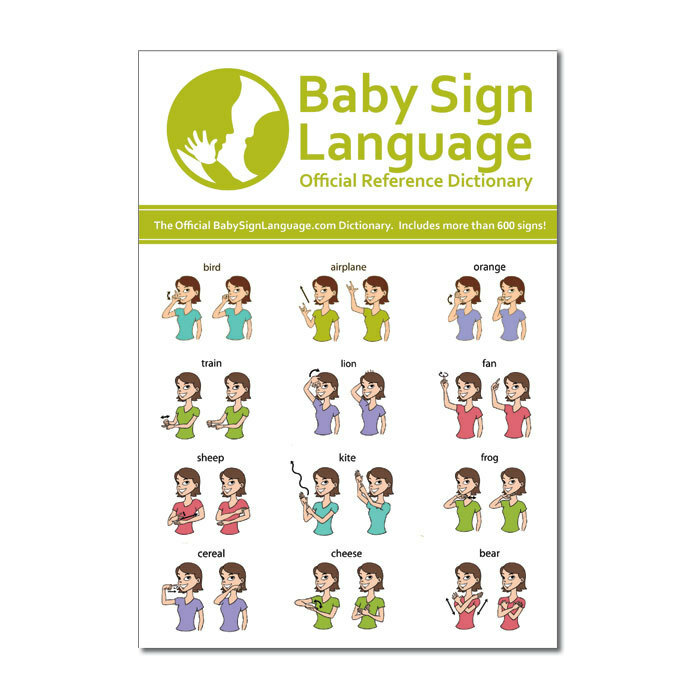 After doing some research online, we found Baby Sign Language and bought it for home use. Although not deaf or hard of hearing, he understands everything that we told him, he just couldn’t articulate what he wanted to say. Our grandson’s frustration level went from very high to very low after a couple of weeks of working with the sign language program. He was able to tell us what it was he wanted and we were finally able to have him communicate back with us! He picked up words much faster than we did and he enjoyed teaching us new words he learned at school. I would often pretend that I had “forgotten” a sign or would make a “wrong” sign to encourage him to correct me! It worked 99% of the time! Since then, his language skills have picked up, but there are still times when he falls back on sign language to communicate. We even use it to remind him to say “please” and “thank you” without verbally reminding him and everyone thinks he is such a polite young boy for remembering his manners! :) I have since donated the Baby Sign Language set to his school (which they were extremely grateful for), but we still frequent the website for signs either to practice or remind us of various words. We would recommend this program to anyone that is experiencing communication problems with a young child. I have the poster on my son’s room and he routinely likes to go through the flash cards. It has helped my son who is under 3 years of age learn just under 40 signs. It is amazing at how quick kids can pick up different signs if they are exposed to them. Beautiful and easy to implement materials! 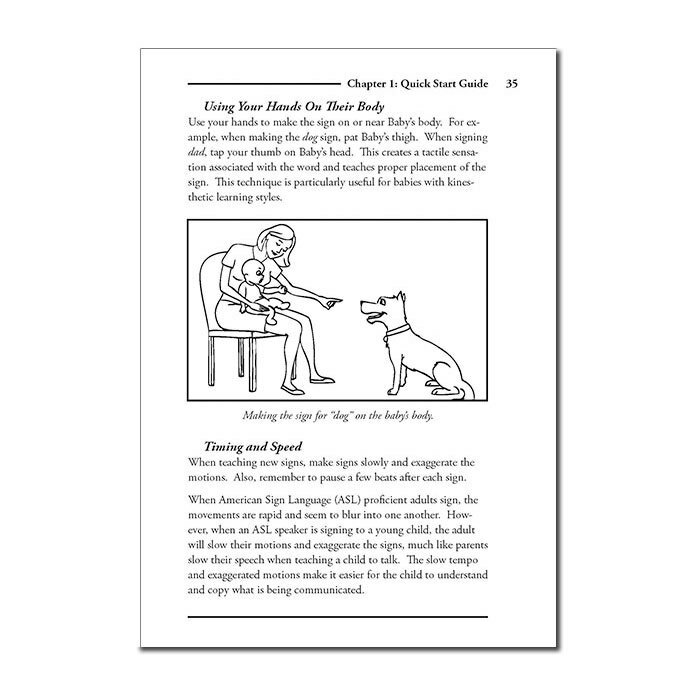 Baby sign language was a wonderful resource for communicating with my daughter when she was a baby. I started signing for her at about 6 months of age and it took her a while to begin signing herself but she understood what I was signing and often reacted to that. It was pretty magical to me when she started to sign. We used it a lot and after a while she began making up her own signs, lol. I totally recommend BSL and will definitely use it with our next baby. I bought the full kit a few years ago. It was amazing and so detailed, it made learning BSL a breeze. The videos helped me so much, in case I was confused on how to make a sign, the videos were right there to show me. 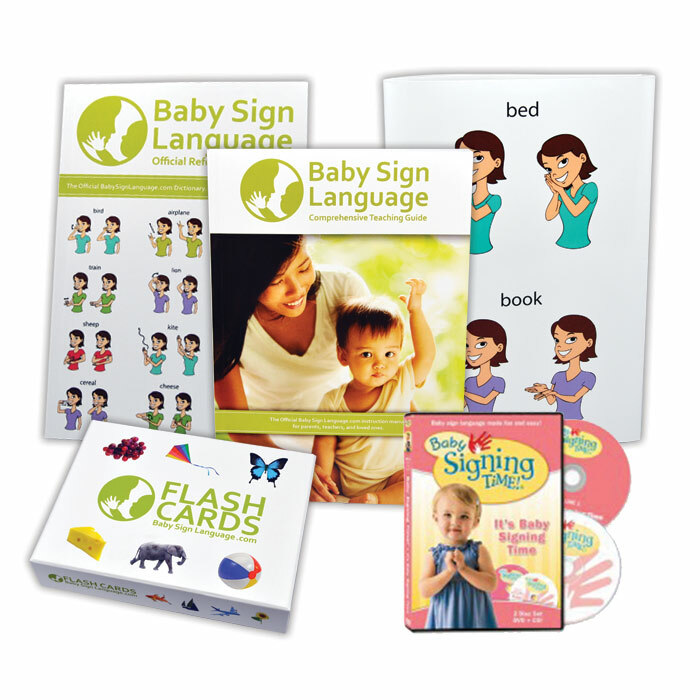 We LOVE Baby Signing Time and the Baby Sign Language Premium Kit. Our daughter asks to watch the videos each morning as part of our morning routine, and even her much older brothers know the words to the songs and can sing along – which is hilarious! 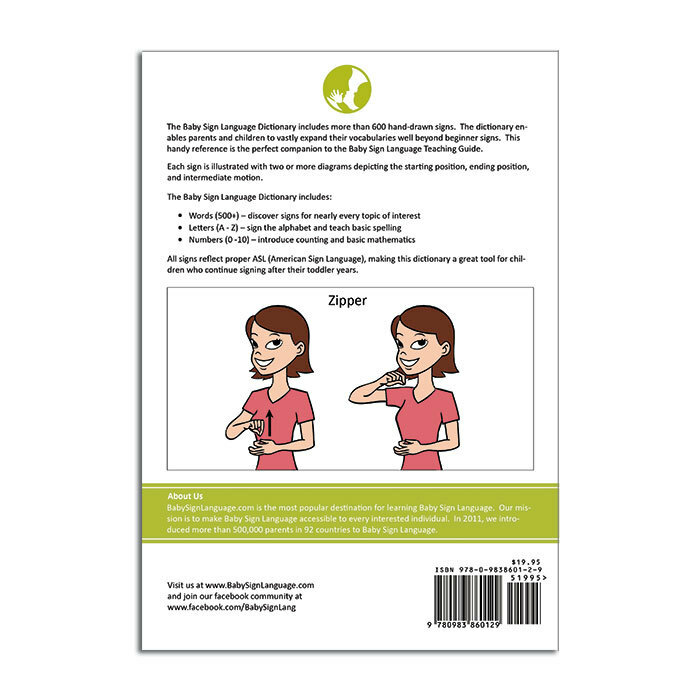 We often meet people who are surprised with how well she is able to communicate via Sign Language and I recommend the Baby Sign Lanugage products to them. We are teaching her three languages and although her spoken words are not yet as abundant as her peers, she is able to communicate with us very well and I definitely see how empowering this is for her. She seems to pick up the signs very quickly and I’m able to build on what we learn here with my formal American Sign Language education. I’m very glad we made the decision to commit to this program for our child. Thank you! The flash cards and videos were invaluable in developing our daughter’s speech. We bought the kit when she was about 1 1/2 and it really helped us communicate with her. Now that she is 2 1/2, it’s obvious that her verbal skills are advanced compared to many other children her age. We’ve expanded beyond these, but she still asks to use the flash cards and watch the videos. It really helps me when I don’t quite understand what she is trying to say that she can use a sign to make herself understood! I would buy this again in a heartbeat! I love this product! I was able to teach my then 5 month old baby sign language. Communication was so much easier. 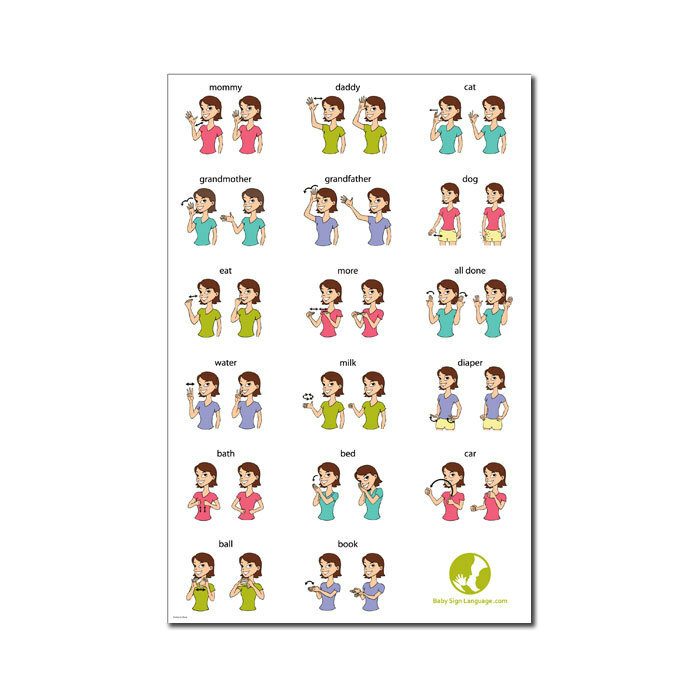 I think this product is very useful for teaching children sign language and my daughter, who is now four uses the cards that come in the set to practice her words and she is trying to do the signs too, so in that respect it is very useful for any parent who has a child who is a baby and on as they get older. Thank you for making this product available and so easy to use, there is nothing out there like that I have I seen and I have two kids and there wasn’t really anything around when my son was younger so now with my daughter it is very useful!! Since this was purchased as a gift for my nephew and his wife on birth of their first child, I cannot tell you how much I liked it. I can tell you, however, that their little girl is quite vocal, articulate, and imaginative and she is now teaching her baby sister to sign. I’d say they are quite pleased, and would rate it a five star! I used this kit with my firstborn and it really worked wonders! Before he was able to communicate with speech he was using his signs to show me he was hungry, he wanted something to drink, or even that he needed a diaper change! I loved it so much 2 years later when he had a baby brother I was ready to use it all over again. Now both my boys 3 d soon to be 2 years old us baby signing on a daily basis and they continue to grow in it. I even felt it helped develop their speech better. Our friends would be impressed at how clearly my children were speaking so early on especially compared to others and I really feel baby signing time was a great contributing factor to this! I loved this kit! My little boy was able to communicate at such a young age! 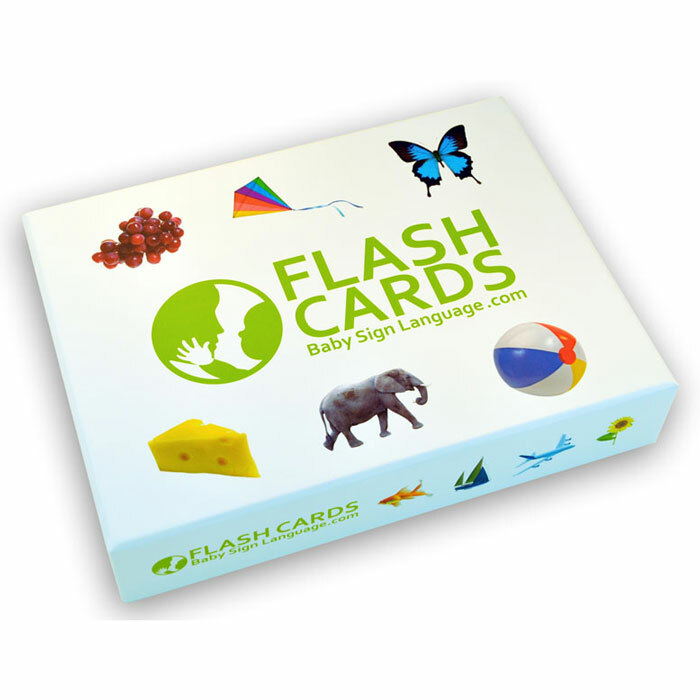 The descriptions are easy to understand and the flash cards turned into a lot of fun games. The poster is still hanging on the wall. He is 21 months now, and babbling away, but still loves to do his signs. We’ll definitely use it again for his baby brother who is due next month! My son loves the DVDs and signs for me to play them for him regularly. The material and dvds also made it easy for my husband and I to learn too. It has made communicating with my son so much easier at such a young age. I was impressed at how fast he started signing.